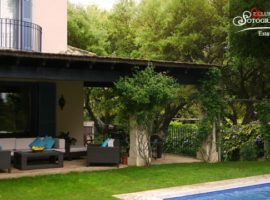 Beautiful rental villa in the favorite area of Sotogrande Costa. This perfect family home offers all the luxury you need. The property has very high standard finishings throughout and is located within walking distance of shops and restaurants. By car it is only a few minutes away from the Sotogrande beach and beach clubs. 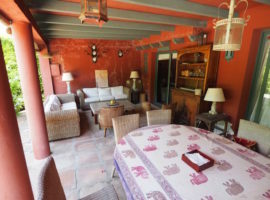 The villa offers 5 bedrooms, 4 bathrooms, a luxury living room, guest toilet, fully equipped modern kitchen and a spacious, child friendly garden with private swimming pool. The ground floor has 1 bedroom with twin beds, patio doors and balcony; 1 bedroom en-suite with King size bed and 1 bedroom with Queen size bed. Two bedrooms are sharing 1 bathroom. On the first floor is one bedroom with en-suite bathroom and King size bed. Located in annex, externally accessed you will find bedroom number five with en-suite bathroom and King size bed. The terrace is gated, so ideal for families with young children. Lovely outside dining space. Three bedrooms have SKY TV and all the bedrooms have internet connections. One bedroom has international radio. Two bedrooms have a private balcony with table and chairs. The balcony to the main bedroom has two loungers, table and chairs. The other bedroom is adjacent to the pool. Sotogrande is situated in the province of Cadiz on the southwest coast of Spain. The resort boasts beautiful Andalusian countryside, including the Almenara Mountains which lead down to the Mediterranean at the mouth of the Guadiaro river. Here you will find multiple golf courses, sports facilities which range from tennis, to polo, to horse-riding, not forgetting its wonderful spa facilities, activities for kids and numerous restaurants. There is also a magnificent marina and a beautiful beach, yet despite all the facilities, the resort remains relatively unspoilt and traditional. Only 20 minutes away from Gibraltar Rock which makes a fantastic day out, as well as the nearby attractions such as “La Alhambra de Granada” and the cities of Jerez, Seville and Ronda, or you can even take a ferry over to Morocco. Only 30 minutes east of Sotogrande is the International resorts of Puerto Banus and Marbella.